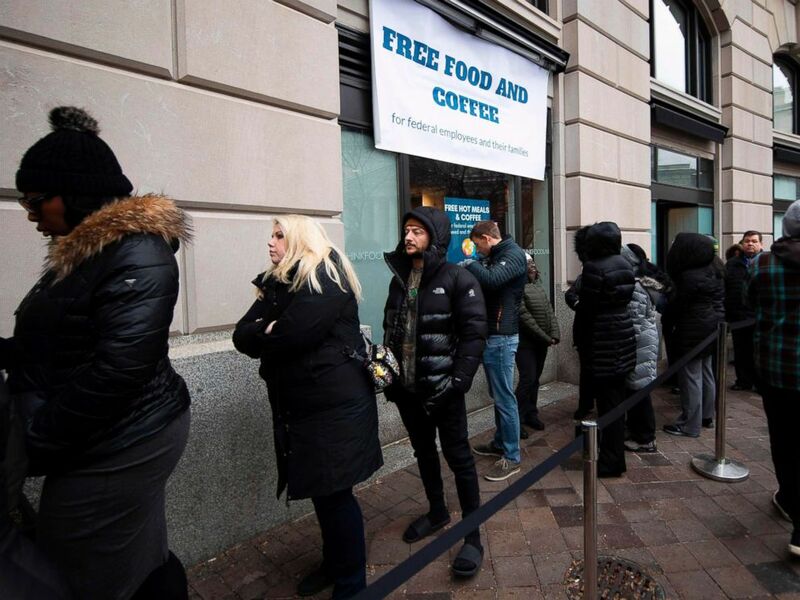 Hundreds of furloughed federal workers waited on Friday to get free food at a pop-up kitchen on Pennsylvania Avenue — not far from the White House and Capitol — on Day 28 of the longest-running government shutdown. Organizers say the kitchen, which opened Wednesday, has served more than double the number of meals expected as the political stalemate continued, causing some 800,000 federal workers to miss paychecks — even though thousands of government employees are required to keep working. Furloughed workers waiting in a line that snaked around the building that houses the Washington, D.C., kitchen were served grilled steak sandwiches, falafel quinoa bowls. Vegetable and bulghur wheat soup were also on the menu. Leaving the March for Life and ran into this: Chefs offering free food and coffee to federal workers and their families. Federal workers stay in line for a free hot meal at Andres in Washington, Jan. 16, 2019, as the restaurant provided meals for federal families affected by the U.S. government shutdown. With a federal ID, government employees could receive a free meal from 11 a.m. to 6 p.m. at Jose Andres' "#ChefsForFeds" pop-up kitchen. The first day, 4,400 meals were served — double what organizers expected they said on Twitter. The second day, that number rose to 5,558. "And we will be there every day until this shutdown ends!" Andres tweeted. And at a food bank in Arlington, Virginia, Democratic Sen. Mark Warner passed out potatoes and apples to furloughed federal workers in need. He also cut a check, personally donating $7,250 — his salary for the last pay period that federal workers missed getting their paychecks. 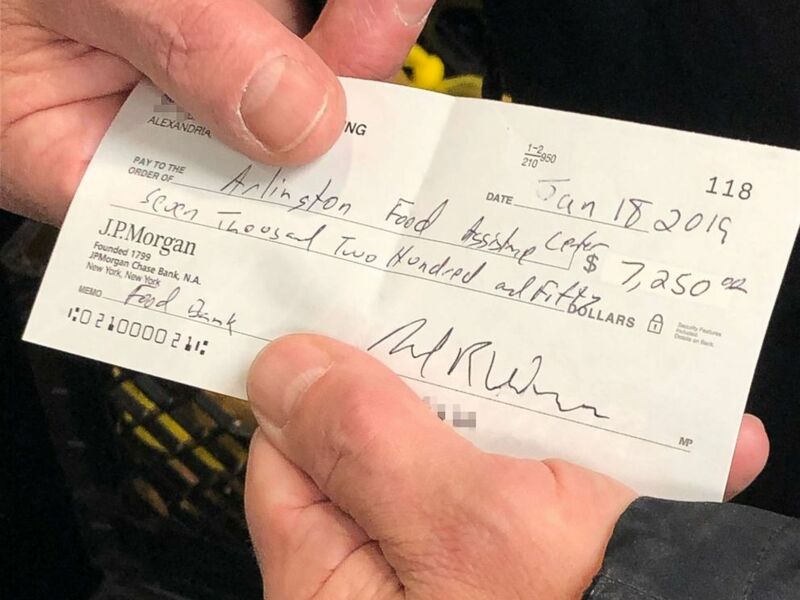 Sen. Mark Warner gave a check for $7250.00 to a food bank in Arlington, Va., after spending time passing out food to furloughed government workers and families in need, Jan. 18, 2019. On the political front, the bitter words continued Friday. House Speaker Nancy Pelosi, whose official trip overseas on a military aircraft was abruptly blocked Thursday by President Donald Trump, accused the president and his administration of leaking her plans to possibly fly commercialy instead and endangering lives as a result. "After President Trump revoked the use of military aircraft to travel to Afghanistan, the delegation was prepared to fly commercially to proceed with this vital trip to meet with our commanders and troops on the front lines. In the middle of the night, the State Department's Diplomatic Security Service provided an updated threat assessment detailing that the President announcing this sensitive travel had significantly increased the danger to the delegation and to the troops, security, and other officials supporting the trip," Hammill said. Due to "grave threats" the delegation decided to postpone the trip, Hammill said. The White House called the assertion a "flat out lie." Trump continued to go after Pelosi in tweets Friday morning. "Why would Nancy Pelosi leave the Country with other Democrats on a seven-day excursion when 800,000 great people are not getting paid," Trump tweeted. "Another big Caravan heading our way. Very hard to stop without a Wall!" The president had no negotiations scheduled with congressional leaders Friday, but has been meeting with bipartisan groups of lawmakers throughout the week. In the increasingly personal standoff between President Donald Trump and House Speaker Nancy Pelosi, the president on Thursday announced he had postponed Pelosi's official trip to Belgium and Afghanistan — cutting off her access to military aircraft — in apparent retaliation for Pelosi asking Trump to delay his State of the Union Address until after the government shutdown ends. "Due to the Shutdown, I am sorry to inform you that your trip to Brussels, Egypt, and Afghanistan has been postponed," Trump wrote in a sharply-worded letter released Thursday afternoon, the latest move in a memorable display of Washington political theater. "We will reschedule this seven-day excursion when the Shutdown is over." Trump added that he feels "it would be better" if Pelosi was in Washington negotiating with him "and joining the Strong Border Security movement to end the shutdown." 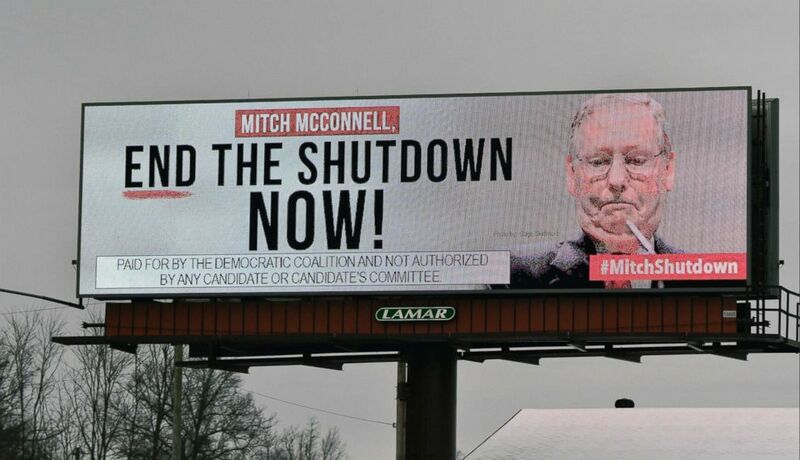 An electronic billboard, sponsored by the Democratic Coalition, calls for Mitch McConnell to end the shutdown on Jan. 12, 2019 in Nicholasville, Ky. The State Department announced Thursday it was calling back nearly all staff next week and paying them for a two-week period, but a growing number of U.S. diplomats are frustrated by the partial government shutdown and the damage it's inflicting on their jobs and America's standing abroad. While they’ll be paid for this pay period, several diplomats are calling on the administration to fully reopen the government, as they struggle to interact with counterparts abroad and pay their own bills. Employees have been either furloughed and sent home or are working with no pay and limited in what kind of work they can conduct. "Morale is pretty rock bottom," said a Foreign Service officer based in Europe, "And this is among a really dedicated, really patriotic bunch of people who are unfortunately getting these messages that what they’re doing is not important or that they’re not valuable enough to have somebody figure out how to get them paid." Read more related shutdown coverage from ABC News' Conor Finnegan. 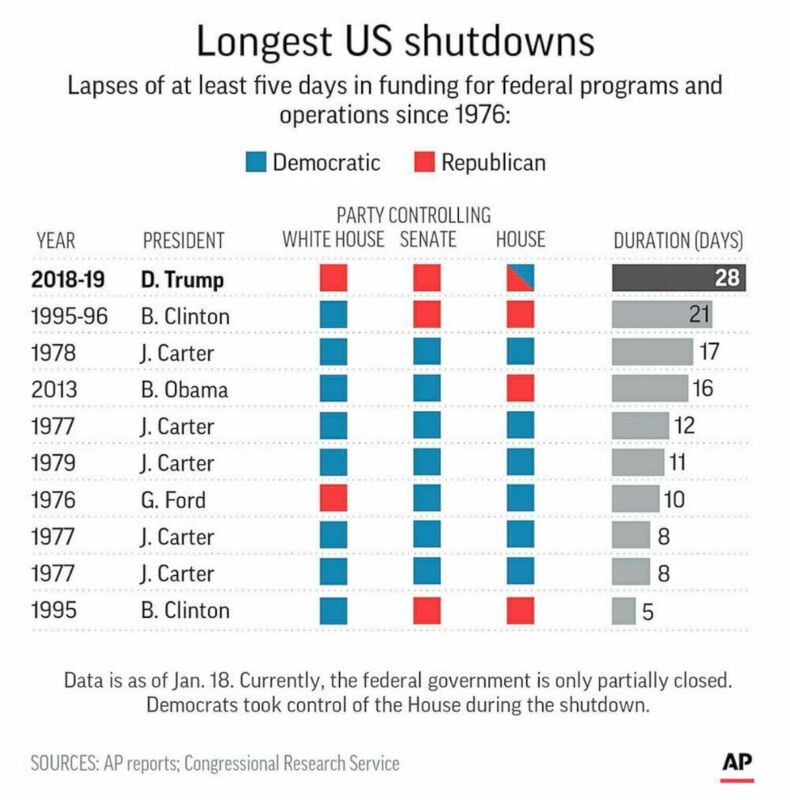 This Associated Press graphic shows gaps in federal funding of at least five days since 1976. While many families were enjoying Christmas, an undercover FBI agent was communicating with a man who was suspected of plotting an attack on the White House, court documents show. It was days after the government initially shut down and the agent was not getting paid. But the work resulted in the arrest of Hasher Jallal Taheb, a man in Georgia who federal authorities accused of plotting to attack several prominent locations in Washington, including the White House. And now as the partial government shutdown is in its fourth week, federal employees are furloughed or not receiving pay for the work they are doing. Read more related shutdown coverage from ABC News' Luke Barr and Josh Margolin.